The U.S. Department of Energy has announced the launch of the fourth Wood Stove Design Challenge in partnership with the Alliance for Green Heat. Teams from around the world will compete for up to $25,000 in prizes. 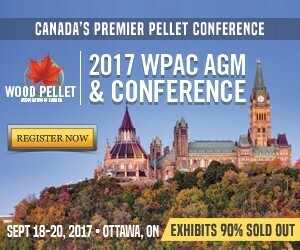 International Wood Industries is moving forward with a plan to build a sawmill and colocated wood pellet mill in northeastern Ontario. The target construction date is in the spring 2018, with startup in January 2019. FutureMetrics has published a new white paper on the Japanese industrial wood pellet market. The report predicts most of demand growth for industrial wood pellets after 2019 will come from Japan and South Korea. On Aug. 14, Germany-based RWE AG released second quarter financial results. A quarterly financial report released by the company briefly discusses plans to cofire biomass at two coal-fired power plants. A report filed with the USDA Foreign Agricultural Service’s Global Agricultural Information Network notes wood pellet production in the EU reached approximately 14.8 million metric tons in 2016, accounting for about half of global production. BioAmber Inc. recently released second quarter financial results, announcing quarterly revenue of $4.1 million. The company also discussed plans to develop a second biorefinery in North America. The Biomass Thermal Energy Council recently announced that validation testing of its biomass boiler efficiency protocol will begin in September at ClearStak LLC, a Connecticut-based testing laboratory. On Aug. 10, Rentech released second quarter financial results, reporting the quarter continued to be challenging. During an investor call, Keith Forman, president and CEO of Rentech, discussed factors resulting in lower quarterly revenues. A collaboration between the state of Idaho and Idaho National Laboratory could help turn 6,000 tons of alfalfa containing elevated levels of bromide into biopower used for industrial heat and electricity. Clemson University scientists have received a federal grant to evaluate the effectiveness of producing biofuels to mitigate climate change.The research will quantify the impact that growing feedstock has on local temperature and carbon sequestration. The Illinois Department of Transportation has approved implementation of a renewable energy demonstration project using grasses collected from mowing highway rights-of-way (ROW). Sandia National Laboratories is testing whether one of California’s largest and most polluted lakes can transform into one of its most productive and profitable using algae.